It all started innocently enough. I found myself needing to calculate the area of a circle for the first time in .NET. 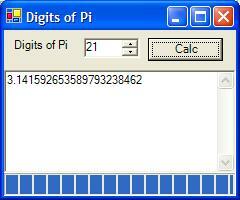 This called, of course, for an accurate representation of pi. System.Math.PI is handy, but since it only provides 20 digits of precision, I was worried about the accuracy of my calculation (I really needed 21 digits to be absolutely comfortable). 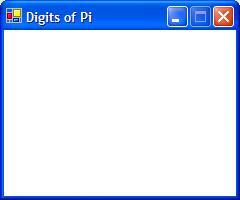 So, like any programmer worth their salt, I forgot about the problem I was actually trying to solve and I wrote myself a program to calculate pi to any number of digits that I felt like. What I came up with is shown in Figure 1. While most applications don't need to calculate digits of pi, many kinds of applications need to perform long-running operations, whether it's printing, making a Web service call, or calculating interest earnings on a certain billionaire in the Pacific Northwest. Users are generally content to wait for such things, often moving to something else in the meantime, so long as they can see that progress is being made. That's why even my little application has a progress bar. 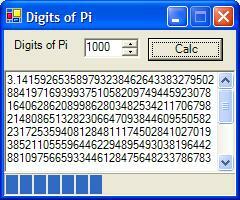 The algorithm I'm using calculates pi nine digits at a time. As each new set of digits are available, my program keeps the text updated and moves the progress bar to show how we're coming along. For example, Figure 2 shows progress on the way to calculating 1000 digits of pi (if 21 digits are good, than 1000 must be better). Everything was going along fine until, in the middle of actually calculating pi to 1000 digits, I switched away to do something else and then switched back. What I saw is shown in Figure 3. Figure 3. No paint event for you! The problem, of course, is that my application is single-threaded, so while the thread is calculating pi, it can't also be drawing the UI. I didn't run into this before because when I set the TextBox.Text and ProgressBar.Value properties, those controls would force their painting to happen immediately as part of setting the property (although I noticed that the progress bar was better at this than the text box). However, once I put the application into the background and then the foreground again, I need to paint the entire client area, and that's a Paint event for the form. Since no other event is going to be processed until we return from the event we're already processing (that is, the Click event on the Calc button), we're out of luck in terms of seeing any further progress. What I really needed to do was free the UI thread for doing UI work and handle the long-running process in the background. For this, I need another thread. Now, instead of waiting for CalcPi to finish before returning from the button Click event, I'm creating a new thread and asking it to start. The Thread.Start method will schedule my new thread as ready to start and then return immediately, allowing our UI thread to get back to its own work. Now, if the user wants to interact with the application (put it in the background, move it to the foreground, resize it, or even close it), the UI thread is free to handle all of those events while the worker thread calculates pi at its own pace. Figure 4 shows the two threads doing the work. You may have noticed that I'm not passing any arguments to the worker thread's entry point—CalcPiThreadStart. Instead, I'm tucking the number of digits to calculate into a field, _digitsToCalc, calling the thread entry point, which is calling CalcPi in turn. This is kind of a pain, which is one of the reasons that I prefer delegates for asynchronous work. Delegates support taking arguments, which saves me the hassle of an extra temporary field and an extra function between the functions I want to call. Notice that we're passing nulls for the last two arguments of BeginInvoke. These are needed if we'd like to harvest the result from the function we're calling at some later date (which is also what EndInvoke is for). Since the CalcPi function updates the UI directly, we don't need anything but nulls for these two arguments. If you'd like the details of delegates, both synchronous and asynchronous, see .NET Delegates: A C# Bedtime Story. At this point, I should be happy. I've got my application to combine a fully interactive UI that shows progress on a long-running operation. In fact, it wasn't until I realized what I was really doing that I became unhappy. As it turned out, I had just gotten lucky (or unlucky, depending on how you characterize such things). Microsoft Windows® XP was providing me with a very robust implementation of the underlying windowing system on which Windows Forms is built. So robust, in fact, that it gracefully handled my violation of the prime directive of Windows programming—Though shalt not operate on a window from other than its creating thread. 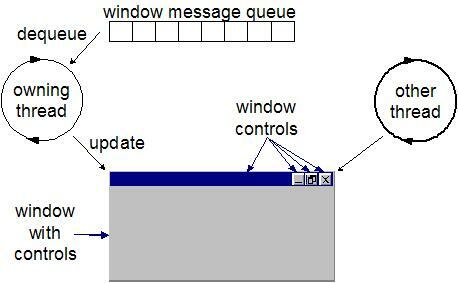 Unfortunately there's no guarantee that other, less robust implementations of Windows would be equally graceful given my bad manners. The use of Invoke has finally given me a safe use of multithreading in my Windows Forms application. The UI thread spawns a worker thread to do the long-running operation, and the worker thread passes control back to the UI thread when the UI needs updating. 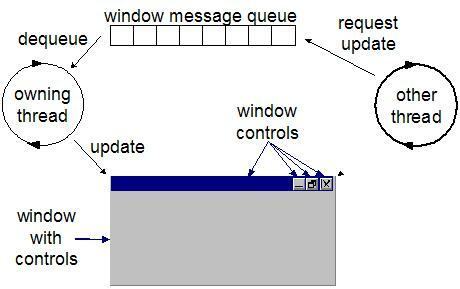 Figure 5 shows our safe multithreading architecture. BeginInvoke is always preferred if you don't need the return of a function call because it sends the worker thread to its work immediately and avoids the possibility of deadlock. I've used this short example to demonstrate how to perform long-running operations while still showing progress and keeping the UI responsive to user interaction. To accomplish this, I used one asynch delegate to spawn a worker thread and the Invoke method on the main form, along with another delegate to be executed back in the UI thread. One thing I was very careful never to do was to share access to a single point of data between the UI thread and the worker thread. Instead, I passed a copy of the data needed to do the work to the worker thread (the number of digits), and a copy of the data needed to update the UI (the digits calculated so far and the progress). In the final solution, I never passed references to objects that I was sharing between the two threads, such as a reference to the current StringBuilder (which would have saved me a string copy for every time I went back to the UI thread). If I had passed shared references back and forth, I would have had to use .NET synchronization primitives to make sure to that only one thread had access to any one object at a time, which would have been a lot of work. It was already enough work just to get the calls happening between the two threads without bringing synchronization into it. Of course, if you've got large datasets that you're working with you're not going to want to copy data around. However, when possible, I recommend the combination of asynchronous delegates and message passing between the worker thread and the UI thread for implementing long-running tasks in your Windows Forms applications. I'd like to thank Simon Robinson for his post on the DevelopMentor .NET mailing list that inspired this article, Ian Griffiths for his initial work in this area, Chris Andersen for his message-passing ideas, and last but certainly not least, Mike Woodring for the fabulous multithreading pictures that I lifted shamelessly for this article. Chris Sells is an independent consultant, specializing in distributed applications in .NET and COM, as well as an instructor for DevelopMentor. He's written several books, including ATL Internals, which is in the process of being updated for ATL7. He's also working on Essential Windows Forms for Addison-Wesley and Mastering Visual Studio .NET for O'Reilly. In his free time, Chris hosts the Web Services DevCon and directs the Genghis source-available project. More information about Chris, and his various projects, is available at http://www.sellsbrothers.com.